In 1897, Italian economist Vilfredo Pareto, in his study of the patterns of wealth and income, observed that the distribution of wealth was predictably unbalanced. He first discovered this pattern in 19th-century England and found it to be the same for every country and time period he studied. 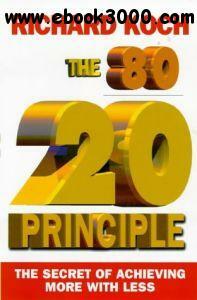 Over the years, Pareto's observation has become known as the 80/20 principle. Now Richard Koch takes a fresh look at the 80/20 principle and finds that the basic imbalance observed by Pareto 100 years ago can be found in almost every aspect of modern life. Whether you're investing in stocks, analyzing company sales, or looking at the performance of a Web site, you'll find that it's usually 20 percent that produces 80 percent of the total result. This means 80 percent of what you do may not count for much. Koch helps you to identify that 20 percent and shows you how you can get more out of your business, and life, for less. When the Market Moves, Will You Be Ready?